30E 60E 90E 120E 150E 180 150W 120W 90W 60W 30W 0 Fig. 5.52 Horizontal velocity for Q = —Qo sin X cos 0 with no meridional boundaries. The corresponding velocity map is shown in Figure 5.52. 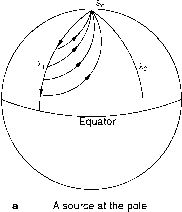 There is clearly poleward flow in the region of evaporation (resembling the Ekman suction) in the eastern hemisphere, and equatorward flow in the western hemisphere. In addition, geostrophic flow is divergent because f = 2m sin 0 changes with 0. 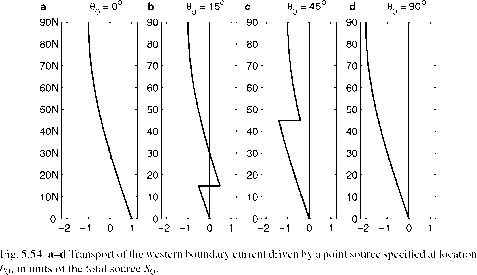 Thus, the western boundary current should carry an equatorward transport, as shown in Figure 5.53a. In the basin interior there is a cyclonic poleward flow, and there is an equa-torward western boundary current. This case is very similar to the result of Stommel et al. (1958) but, due to the spherical geometry, returning flow always exists along the western boundary. For the general case of a point source placed at the western boundary at latitude 00, the solution is as follows. There is an interior upwelling driven by the source, so that there is always the same cyclonic flow in the basin interior. 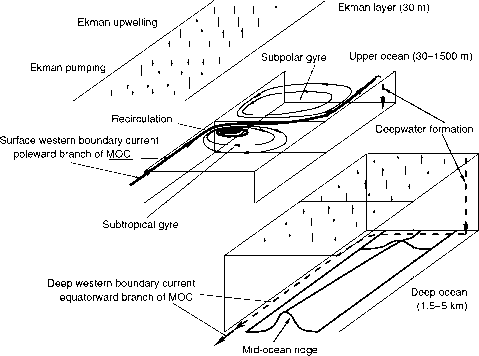 However, the transport of the western boundary current may vary depending on the exact location of the source (Fig. 5.54). Fig. 5.53 Source-driven flow on a sphere: a source at the pole; b source at the equator (redrawn from Stommel and Arons, 1960a). shown in Figures 5.53b and 5.54a. If the source is south of 30° N, the western boundary current is equatorward south of the source and poleward in the vicinity north of the source; however, north of 30° N, the western boundary current is equatorward (Fig. 5.54b). 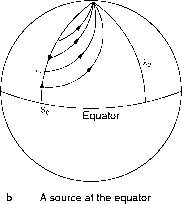 If the source is north of 30° N, the western boundary current is always equatorward. In particular, if the source is placed at the North Pole, the transport of the western boundary current is twice the strength of the source. Therefore, the western boundary current transport is quite non-intuitive, owing to mass balance of the model and the special nature of spherical coordinates. If a sink is placed at the western boundary, the circulation is opposite to that produced by a source; the corresponding solutions are shown in Figure 5.55. It is interesting to note that if the sink is placed at 15° N, the western boundary current transport in the vicinity of the sink is toward the sink (Fig. 5.55b). Such a flow pattern is quite similar to the case of a non-rotating fluid; however, other than this case, the flow pattern driven by a point source/sink on a rotating sphere can be quite different from the corresponding pattern of flow produced by a point source/sink in the classical non-rotating fluid.